Jayfrost’s paws pounded against the forest floor. Her heart raced as she followed behind Sundance, her pale ginger pelt flashing in the bursts of sunlight between the trees. The rest of the battle patrol thundered behind them. Her worst fears were coming true. The badger that Jayfrost had prayed she would never see again was back, and now every cat in BlogClan was in danger. Every hair on her pelt was trembling – she knew the only way for her Clan to be safe was a fight, to drive the badger out for good. And that terrified her. She wasn’t the only one. Sundance was panting ahead of her, and every time she turned enough for Jayfrost to see her face, her green eyes were glazed over with horror. Behind her, she could hear muffled crying, she thought from Meadowpaw. As bad as she felt for the apprentice, she didn’t stop to comfort her. The threat of the badger was far too urgent. Finally, Sundance slowed as they came upon a clearing. The other cats halted behind her as she sniffed at a nearby tree stump, visibly shaking. Jayfrost’s legs were shaking from the run, and her lungs burned as she tried to catch her breath. But even through her exhaustion, she could smell the overwhelming stench of badger in the clearing. Around her, she could see the other cats looking similarly winded. Flame, Winterpaw, and Owlwater looked unsteady on their paws, Elkheart and Shimmerfrost were panting, and with Olivepaw leaning against her shoulder Meadowpaw stumbled towards them on shaking legs. Amberstorm and Crystalpaw sat nearby, ears drooping. Relief broke over Jayfrost. She knew there was still a fight ahead of her, but the longer until she had to see a massive badger bearing down on all of them, the better. Aloud, she mewed, “That’s good. That gives us more time to plan.” Her chest hurt less now, her breathing starting to return to normal. It took her a few moments to realize that every cat’s eyes had turned to her. Jayfrost’s breath caught. Right. She was the one who’d organized the battle training, and the most senior warrior present; she was the one to lead this battle. Jayfrost fought back the wave of panic that threatened to overwhelm her. Whatever doubt or fear she felt, she had to ignore it, for the sake of her Clan. She had to lead these cats into battle. “How?” Olivepaw demanded, a frustrated gleam in her eyes. Jayfrost couldn’t blame her. Even with eleven of them, they were hardly a force to be feared. Six starving, downtrodden cats with their pelts clinging to their bones, a dull glaze to their eyes and a weary drop to their whiskers, stared back at her. Four undersized apprentices, looking about as intimidating as drowned rats, looked at her with dull, bleary eyes. These cats couldn’t scare off a mouse, let alone a ferocious badger. “And bring it to you?” Elkheart guessed, ears perking in interest. The faces looking back at her didn’t hold much hope in her words, and in truth, neither did she. Even with eleven of them, she doubted the badger was going to just flee into the night without a vicious fight first. But if they were able to catch it off guard, perhaps they had a chance to chase it off without taking too much risk. They had to try. Slowly, Jayfrost’s Clanmates began nodding. They were beginning to look more alert now that there was a plan in place, and something to fight for. Their eyes gleamed with new strength, they sat a little bit straighter, their claws flexing. Looking at them, Jayfrost almost began to feel hope. After what felt like endless moons of fighting, Clanmate turning against Clanmates as their hopeless plight made them bitter against each other, Jayfrost was finally starting to feel like her Clan was one again. “Then let’s go,” she growled, claws sliding free of their sheathes. For the first time, she was grateful for the surge of wild instinct in her blood that had driven her to fight against her own Clanmates. She would need that boldness and fury for the battle ahead. The badger-scent led the patrol further into the forest. As they followed it, Jayfrost began to recognize the terrain. They were coming close to the place where she had rescued Sandykit, and where she had seen the badger asleep. She wondered whether it had returned to its den. Her suspicions were confirmed as they finally came upon the source of the scent. The horrible stench of the badger had been growing more and more noticeable, until their entire forest seemed flooded with it. When Jayfrost thought she could bear it no more, they came upon a small hill, and looking over the edge, were able to see the badger. Below, in the same sandy burrow she had seen before, a massive gray mass of fur lay, half in and half out of its den. Jayfrost’s pelt began raising at the sight of the creature, and she heard Crystalpaw give an audible gasp. Last time Jayfrost had seen the badger, it had been asleep. The sleeping animal, and the threat of waking it, had been terrifying enough. But now, it was wide awake. Two beady, brown eyes, dark and round as berries, were blinking and open in the broad black-and-white striped face. Between the massive paws lay a squirrel; Jayfrost was too terrified to muster the slightest anger at the stolen prey. The badger was eating, low grunts and snorts as it feasted reaching the hiding warriors. A shudder ran through Jayfrost’s pelt as she heard the crunch of squirrel bones, the massive jaws of the badger snapping the squirrel’s bones like twigs. She didn’t have to think hard to imagine those jaws snapping cat bones. For a moment, she could do nothing but stare at the creature in horror, trembling all over. She wasn’t a warrior. She wasn’t a soldier, or a fighter of any kind. She was just a twenty-year-old girl with decades of her life ahead of her, who wanted nothing more than to be safe at home with nothing scarier than her next college exam ahead of her. A whimper from one of the apprentices snapped Jayfrost out of her terrified thoughts. The warrior gave a sharp shake of her head, growling to herself. She wasn’t the only cat in danger. Her Clanmates needed her to focus. For a moment, Jayfrost wondered whether this wasn’t the best time to attack. Startling the badger while it was out and about was one thing. But right now, it was in its den, in the middle of eating its prey. It was likely to be highly territorial and defensive. Maybe attacking it another time would be better. Jayfrost almost gave the order to back off. But as she thought on it, she decided it was better to drive it away here, once and for all, to show the badger that this den wasn’t welcome to it anymore. Jayfrost looked back at her patrol, meeting Flame’s gaze for a moment. Flame and her half of the patrol were looking at her, terrified, but waiting for her command. Something in Jayfrost’s chest clenched. The weight of what she was asking these cats to do was truly sinking in. But a small nod from Flame reassured her. Jayfrost gave a commanding lash of her tail, signalling Flame’s patrol. With a last dip of her head, the black-and-ginger she-cat slipped off into the ferns, the cats Jayfrost had assigned following after her. Jayfrost and her cats stayed on the small hill, overlooking the badger’s den. She hoped if the badger was faced with the sight of five cats raining down on it from above, it would turn tail. They watched in silence, hearing only the badger’s chewing, and the sounds of the forest. Jayfrost could only hope Flame and her cats were circling around the badger like she’d asked. Finally, she spotted them. Flame’s pelt was just visible through the undergrowth, a flash of Crystalpaw’s white-patched fur in the grass. They were on the other side of the badger, just a few fox-lengths away. Jayfrost held her breath as Flame crept closer, her narrowed eyes focused on the badger. Suddenly, the badger looked up from its meal, beady eyes blinking. Flame froze in her tracks. Jayfrost’s breath caught; had the badger seen Flame’s patrol? But the massive creature didn’t look in their direction. Instead, it rose to its paws, trudging away from its den on thick, stumpy legs. The badger left the half-eaten squirrel behind and made its slow way into the bushes beyond, angled away from Flame’s patrol. Jayfrost released the breath she had been holding, relief crashing over her. That relief turned to horror as a horrible snarling arose, and a cat’s screech of terror was heard. With yowls of terror, Flame and her cats fled from the ferns. The badger burst out after them, jaws slavering and eyes blazing with hatred. Jayfrost’s entire pelt quivered with horror. In battle, the badger seemed absolutely monstrous, looming over the cats as it bore down on them, every hair on its pelt bristling with the fury of battle. Jayfrost’s heart clenched as the badger caught up with Crystalpaw, catching her flanks with it’s terrible jaws. No! “Attack!” Jayfrost screeched, flinging herself down from the ledge, her patrol streaming after her as she led the charge against the badger. The creature released its grip on Crystalpaw and whirled to face them, snarling in fury. Jayfrost nearly turned tail and fled at the sight of the furious animal; only the need to protect her Clanmates kept her flying towards the badger, yowling her battle cry. That battle cry died in her throat as the badger lunged at them. Jayfrost barely managed to avoid the swipe of one of its massive paws. She whirled out of range, landing hard on her front paws, and racing back towards the badger. Around her, her Clanmates were also locked in battle. 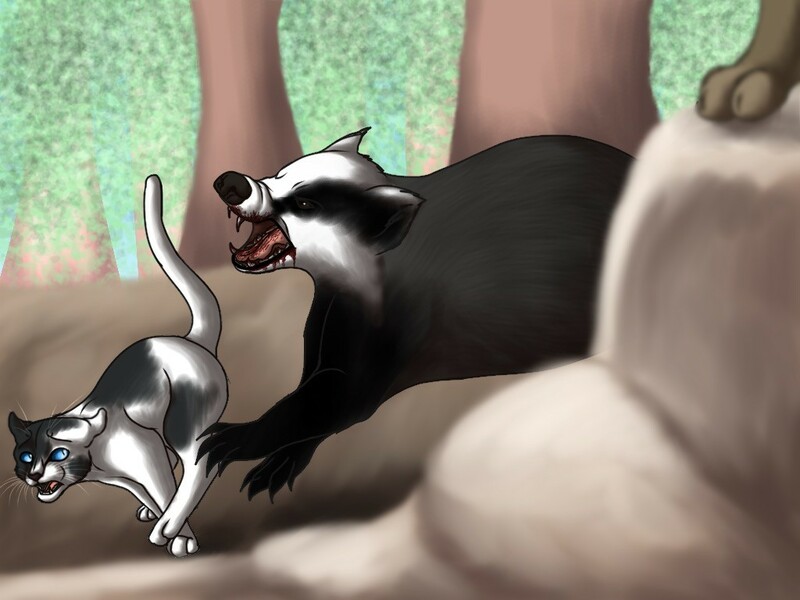 Crystalpaw and Olivepaw were standing before the badger, backs arched and swiping at it with outstretched claws. Elkheart was on the badger’s shoulder, clinging desperately to it’s pelt with claws and fangs. Shimmerfrost and Owlwater were atop the badger’s back, digging their claws into its back and hanging on for dear life. Winterpaw had the badger’s hind leg between his teeth, and Ambertalon and Meadowpaw were pulling at one of the front legs with their claws. Jayfrost jumped into the fight with Flame and Sundance, darting around the badger and striking out at its side and haunches. The warrior felt fierce satisfaction as fur tore under her claws, blood welling from the badger’s pelt. Cats were swarming all over the creature, its legs buckling from the weight of them. For a brief, shining moment, she truly thought they were going to overwhelm it in sheer numbers. Then, a furious roar from the badger shattered her hope. It rose up on its hind paws, throwing all the cats off of its back. The badger whirled around, snapping its terrible jaws around Winterpaw’s shoulders, yanking the apprentice off of its leg. Winterpaw screeched in terror as the badger pinned him to the ground with its front paws and began to bite and tear at his pelt. Jayfrost’s pelt quivered at the agonized screech that rose from the apprentice. With a furious snarl, Olivepaw raced in to defend her Clanmate, leaping on the badger’s neck and biting its muzzle. The badger released its grip on Winterpaw, shaking its head violently, dislodging Olivepaw and sending her flying. Olivepaw landed on the ground with a hard thud, tumbling a few times before finding her footing. With a wince, she limped back into battle. Cats were flooding over the badger again. Now that Jayfrost had a closer look at the animal, it didn’t seem that much larger than them, at least compared to how she’d imagined. How weren’t they able to beat it? But every time she thought they were going to wrestle it to the ground, it always broke free. Jayfrost and Elkheart managed to grip its haunches, but it threw them off. Winterpaw’s feeble attempt to rejoin the fight was quickly cut off when the badger swatted him away, sending him to the ground. He didn’t get up again. Elkheart was bleeding heavily from the side of her neck, her eyes glazing over, while Flame got a nasty bite to one shoulder as she delivered a series of scratches to the badger’s muzzle. Every time a cat tried to get a grip on the badger’s loose pelt, it managed to shake them off, or pull them loose. Jayfrost surveyed with horror as the fighting moves she had taught her Clanmates failed again and again. It seemed like every cat was either limping, bleeding, or unconscious. With a rush of horror, it hit Jayfrost that there was a very real possibility one of them would die. Enraged, Jayfrost dug her claws into the badger’s sides and tried to haul herself up onto its back, like she’d taught her Clanmates. But the badger’s pelt slipped under her paws. It was too loose to get a grip on. The badger whirled on her, clamping its jaws around her back before she could dodge. “RE-OWWR!” Blinding, searing pain shot through Jayfrost’s entire body. She had never felt anything this excruciating. For a moment, she feared that the badger had snapped her delicate spine, but after a moment discovered she could still move all her limbs. She began struggling and thrashing, desperately fighting to get free of the badger’s grip. Jayfrost managed to twist around and claw at the badger’s muzzle, biting its lip, but its grip didn’t loosen for an instant. Sundance slammed into the badger’s shoulder, forcing it to drop Jayfrost. The gray-brown warrior scarmbled free, a burning, pulsing pain in the wounds in her back. She forced herself onto her paws, leaping back into the fight beside Meadowpaw. She and the apprentice wove in and out, as they had practiced, delivering alternating blows to the face before dancing out of reach. But they didn’t have the speed they needed to pull it off. The badger swung its muzzle into Meadowpaw, sending her to the ground. When Jayfrost lunged in to deliver a blow to its ear, the badger turned on her with frightening speed, biting down on her foreleg and yanking her forward onto the ground. Jayfrost barely had time to feel the burning pain in her leg before massive paws came crashing down on her, slamming her head against the ground. Jayfrost’s world exploded with pain. Every vein seemed to be set ablaze, a terrible weight crushing her to the ground, and the sounds of battle were drowned out by the sharp ringing in her ears. She tried to screech, but her body felt too heavy to move. Terrible, blinding light flooded her vision; she shut her eyes tight against it. The warrior was aware how vulnerable she was, lying still on the ground, but her limbs wouldn’t seem to obey her. Slowly, the ringing faded, the light dimmed, and her senses began to return. With an effort, Jayfrost was able to lift her head, blinking blearily as she looked around the clearing. Meadowpaw, Winterpaw, Shimmerfrost, and Elkheart lay unmoving on the grass, only the faint rise and fall of their sides letting Jayfrost know they were still alive. The rest of her Clanmates were still facing the badger. Jayfrost could see the that the gray pelt of the badger was splattered with blood all over, but her Clanmates were far more bloodied. Crystalpaw was standing on three legs, one foreleg held at an awkward angle, and her flanks bleeding heavily from the bite marks of the badger. Sundance was moving stiffly, as though her haunches were bothering her badly, and her movements were far too slow to avoid the heavy paws swiping at her. Only a quick swipe from Owlwater, whose yellow pelt was marked by deep gashes, distracted the badger from snapping her neck. Flame’s ear was badly torn, eyes squinted against the blood trickling down her head. Olivepaw was still atop the badger, but a single, violent shake of the animal sent her crashing to the ground. Jayfrost could barely see Amberstorm under the badger’s paws; she could only hear her terrified shrieks as the badger tore into her. We’re losing, Jayfrost realized, overwhelmed by despair. All of her training had been useless. These weren’t warriors defending the territory they had learned to fight for moon upon moon. These were kids stuffed into the bodies of cats, who had no idea what they were doing, or how to fight and survive. The clumsy, unpracticed strikes and bites of her Clanmates stood no chance against the ferocious strength of the badger. If they kept fighting, they would die, and that wasn’t worth any orders from StarClan or any hopes of grandeur by being real warriors. 71 Responses to "Trailing Stars, Chapter 18; by Jayfrost"
Can I be in a chapter? Pretty please with a fat vole on top?